How do I add Handling Costs to my Orders? 3dcart allows you to add handling costs to your orders. Handling charges are typically used by merchants as a way of recouping order shipping costs. For example, costs for packaging supplies like shipping peanuts, air/bubble wrapping, tape, etc. In some cases, handling charges are also used to factor in special requirements for shipping some items such as hazardous materials, dry-ice for perishable items, and other circumstances. On your 3dcart store, Handling Costs are created by a method in which you specify an additional line item fee that is added to the order. The handling cost can be required on orders over a certain value and can be either a flat monetary amount or percentage of the order's overall value. The following will describe how to set up Handling Costs. Once there, click on the "Handling" link located towards the right hand side. Add an ID and a Name in the provided fields. Turns on the Handling Cost feature. This will exclude gift certificate products from the order total calculation since ordered gift certificate are not physical products but rather a purchased credit on the store. This will exclude eproducts from the order total calculation since eproducts are not physically handled products but rather a purchased download. Now you will need to add order ranges in which the applicable Handling Cost line item will appear. Enter the price of the handling charge. Click Add to set your first range. If you need additional Handling Cost ranges, simply repeat as often as needed to include all your ranges. Since we're dealing with monetary values in the Min/Max ranges, remember to include the .99 cent increments in each! 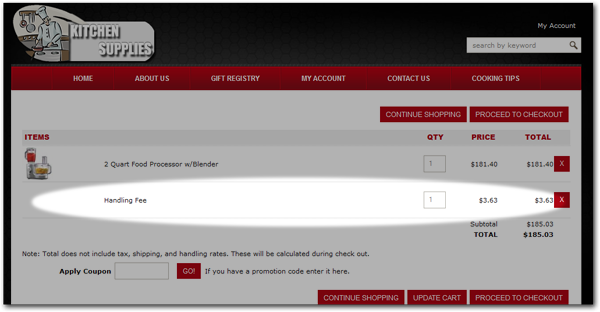 As discussed, the Handling Charge is added to the cart as a line item. Please be aware that this may alter expected shipping rates when using Custom Shipping by Quantity options on the store.